The 2008 conflict in Lebanon began on May 7, after Lebanon's 17-month-long political crisis spiraled out of control. The fighting was sparked by a government move to shut down Hezbollah's telecommunication network and remove Beirut Airport's security chief Wafic Shkeir over alleged ties to Hezbollah. Hezbollah leader Hassan Nasrallah said the government's decision to declare the group's military telecommunications network illegal was a "declaration of war" on the organization, and demanded that the government revoke it. Hezbollah-led opposition fighters seized control of several West Beirut neighborhoods from Future Movement militiamen loyal to the government, in street battles that left 11 dead and 30 wounded. The opposition-seized areas were then handed over to the Lebanese Army. The army also pledged to resolve the dispute and has reversed the decisions of the government by letting Hezbollah preserve its telecoms network and re-instating the airport's security chief. Rival Lebanese leaders reached a deal on May 21, 2008, to end the 18-month political feud that exploded into fighting and nearly drove the country to a new civil war. On December 1, 2006, a series of protests and sit-ins began in Lebanon, led by groups that opposed the government of Prime Minister Fouad Siniora. The opposition group was made up of pro-Syrian Hezbollah and Amal. A number of smaller parties were also involved, including the Marada Movement, the Lebanese Communist Party and the Syrian Social Nationalist Party. Members of the government are part of the March 14 Alliance, a coalition of anti-Syrian political parties and former militias that include the Progressive Socialist Party, the Lebanese Forces and the Future Movement. The two groups are also divided along religious lines, the majority of Sunnis supporting the government and the Shi'a supporting the opposition group. Druze aligned with Walid Jumblatt support the government, while those allied to Talal Arslan have backed the opposition. The Christian community is divided as well, with Michel Aoun claiming to have 70% of the Christian community's support, based on the results of 2005 parliamentary elections. The opposition demanded that the government resign after Shi'a ministers had left the government in protest against a decision concerning the Hariri tribunal, thus unbalancing the proportional representation of religious groups as stipulated by the Lebanese Constitution. The standoff between the March 14 government and the March 8 opposition resulted in a year-long deadlock over the election of a new President to succeed Emile Lahoud whose term had expired. Seymour Hersh believed that the U.S was working to weaken and disarm Hezbollah with the help of Saudi Arabia, who was attempting to strengthen Sunni groups as a counterweight to the Shi'a Hezbollah. Borzou Daragahi, the L.A. Times bureau chief in Beirut, wrote that the Saudis had disowned the attempt by Sunnis in Lebanon to found a militia in the guise of a security force named Secure Plus. As'ad AbuKhalil, a secular leftist and a professor of political science at the California State University, Stansilaus, stated that he believed the US was attempting to fund and arm Sunni militias to instigate a Sunni-Shiite conflict.Pepe Escobar wrote in the Asia Times that the US gave $60 million to the Lebanese Internal Security Forces at the Interior Ministry, and accused the US of fomenting sectarianism in Lebanon. In May 2008 the tensions between the government and the opposition escalated when the government announced a series of security decisions. Heads of the government accused Hezbollah of preparing for a terrorist attack, which was dismissed by Hezbollah as scaremongering. A car heavily damaged during the unrest in Lebanon on May 9. On May 3, leaders of the government accused Hezbollah of setting up a hidden, remote-controlled camera in a container park overlooking the main runway of Beirut's international airport. The accusation is that the Shia movement, which controls the suburbs where the airport is located, was spying on air traffic in preparation for a possible attack, perhaps aimed at assassinating one of the prominent pro-government figures who fly in and out of the facility. Hezbollah dismissed the accusations again, saying that those who leveled them were simply parroting a US campaign against it and other groups which are resisting Israel. On May 6, 2008 the government attempted to disable Hezbollah's communications network. Hezbollah operates a fiber optic telecommunication network, linking its strongholds of south and east Lebanon, and the southern suburbs of Beirut. Hezbollah claimed that the telecommunication network was a key element in the 2006 Lebanon War, which according to Hezbollah was a victory that shocked the Israeli military. The government regarded the network as a breach on its sovereignty. In addition, the network was regarded by the government as an infringement on public funds since it claimed that it competes with its own and using the Lebanese infrastructure. Hezbollah declared that it regards the network as an integral part of its defensive measures against Israel. The government also ordered the commander of security at Beirut international airport, Brig Gen Wafiq Shuqeir, to return to the Army Command who had been suspected of acting on instructions from Hezbollah rather than his employer. Brig Gen Shuqeir hushed up the discovery of a secret surveillance camera allegedly set up by Hezbollah in a container overlooking the main runway, to monitor the movement of aircraft and VIPs. On May 7, 2008 a labor strike which was planned before the month of May turned into violence when pro-government and opposition gunmen started their shootings, leading to clashes among the two groups in Beirut. The next day, Hezbollah's leader Hassan Nasrallah stated on television that the telecommunications network was essential in the militant group's resistance against Israel. Nasrallah further said that the government was declaring war by threatening to shut down the group’s private communications network and persecuting those controlling it. On May 7, 2008, a work strike called for by the country's union federation to demand higher wages and decry high prices was used as a pretext by the opposition to launch its attack. The opposition threw their weight behind the strike which paralyzed large parts of Lebanon's capital Beirut. The clashes were first reported when government and opposition supporters in a pro-Government sector of Beirut exchanged insults and began throwing stones at each other after the Hezbollah men insisted on blocking the roads. Witnesses said security forces intervened and gunshots were heard, apparently troops firing in the air to disperse the crowds. Around the city, pro-Hezbollah protesters carrying machine guns and weapons, blocked roads with burning tires. The road toward Beirut international airport was blocked and cut off from the rest of the city, and the Beirut Port was occupied. By the end of this day, the Hezbollah militia had completely conquered the streets of West-Beirut, enforced an armed blockade on houses of Majority leaders Saad Hariri and Walid Jumblatt, and declared that it will continue with its actions until the Government backs down. On May 8, 2008, minutes after Nasrallah's comments referring to pro-government actions as "a declaration of open war", heavy street battles began. Fighting began along Corniche Mazraa, an avenue separating Shiite and Sunni areas, spreading to the western, southern and eastern parts of Beirut where Sunni and Shiite neighborhoods overlapped. Combat was heard near the office of Lebanon's Sunni religious leader - an ally of the government - and near the official residence of the opposition-aligned parliament speaker. Machine guns and rocket propelled grenades were used by both sides. Opposition militants overran and burnt-down three pro-government offices. More barricades were set up, closing major highways. A CNN correspondent, pinned down with a Lebanese army unit during an intense gun battle, reported that government forces had not reacted to the violence. The army decided not to intervene in the clashes for fear of a breakup of the army along sectarian lines, which happened during the civil war. Fighting from the previous day lasted throughout the night and only stopped for a short time a little bit after dawn on May 9, 2008. However, the fighting quickly resumed after the brief lull. Late in the afternoon, the few Government supporters who had shown some resistance in Beirut had surrendered their arms to the Hezbollah-led opposition. The opposition moved in and took over their abandoned positions in west Beirut, virtually taking over more than half of the capital. About 100 opposition militants in camouflage uniforms marched down Hamra Street. All the media outlets related to the pro-Government Future Movement (Future Television, Future News, Al Mustaqbal Newspaper, and Radio Orient) were occupied by opposition fighters and forced to close. The armed occupation of Beirut by pro-Hezbollah militia-men continued until the end of the crisis with almost no reaction from the Army nor Government loyalists. Later that evening sporadic clashes erupted in Sidon, where two civilians were killed; and in Bar Elias in the Bekaa Valley where a woman was killed. Also, eight people were killed near the town of Aley in clashes between government supporters and opponents. Seven people who were Hezbollah supporters were killed. 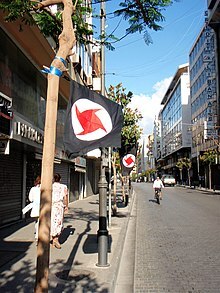 Flags of the Syrian Social Nationalist Party were raised as a victory during the unrest on May 9th, 2008. On May 10, 2008, a funeral procession was attacked by a shop-owner affiliated with the Amal Movement, whose shop was previously burned down by Sunni militants, leaving six people dead. An Associated Press photographer who witnessed the shooting said the attack came as a procession of 200 people headed toward a nearby cemetery to bury a 24-year-old pro-government supporter killed in previous fighting. At least 14 people were killed in the town of Halba, in the Akkar region of north Lebanon, as about 100 pro-Future Movement gunmen attacked an office of the SSNP. 10 of the dead were SSNP members, three were government loyalists and one was an Australian citizen of Lebanese descent on vacation in Lebanon, who was trying to get information at the SSNP offices about evacuating from the city. The Australian father of four, Fadi Sheikh, reportedly had his hands and feet cut off. One other person was killed in fighting in Sidon and two soldiers died in fighting east of Beirut. At least 40 people have been killed, four days after Beirut street battles have ignited. On the other hand, Lebanese Prime Minister Fouad Siniora said the decision on the communications issue would be dealt with by the army. The Lebanese army said it had frozen measures taken by the government against the Hezbollah movement, and called for all armed militants to withdraw from the streets. Then Hezbollah's TV station, Al-Manar, announced that Hezbollah-led opposition forces would withdraw all their gunmen from Beirut in compliance with the Lebanese army's request, but a civil disobedience campaign will continue until the group's demands are met. During the night between May 10 and May 11, heavy fighting broke out between Alawite Hezbollah sympathizers and Sunni supporters of the government in Tripoli. One woman was killed. On May 11, Beirut was quiet, after control of areas seized by the opposition was handed to the Lebanese army. Many roads in the capital remained blocked, including the airport road, as the opposition continued a campaign of civil disobedience. In Tripoli, Sunni supporters of the government had reportedly been fighting opposition followers in the Alawite dominated Jabal Mohsen area with machine-guns and rocket-propelled grenades. On May 9, heavy fighting broke out in Mount Lebanon between pro-government Progressive Socialist Party fighters and Hezbollah. The clashes started in Aytat, near Kayfoun and soon expanded to cover many spots in Mount Lebanon including Baysur, Shuweifat and Aley. Most of the fighting was concentrated on Hill 888. It started when four Druze members of the Aley municipal police were kidnapped by Hezbollah. Soon after the news of the kidnapping spread, the Mayor of Aley assembled a group of PSP fighters and went up to Hill 888. As they reached the hill they were attacked by Hezbollah gunmen who wounded few of the PSP and municipality members. PSP members retaliated killing 3 of the kidnappers. The incident developed into an armed clash. Artillery and mortars were used for the first time during these battles. A ceasefire agreement was supposed to take place at 18:00 of the same day, but fighters from both sides continued to exchange fire. Negotiations were ongoing for the PSP members to give up the fight and surrender their positions to the Lebanese Army, but it never happened. The battles at Aley stopped for several hours, but the two sides clashed again in Mount Barook to the southeast shortly before midnight. Barook separates the Druze heartland of Shouf from the mainly Shi'ite southern end of the Bekaa Valley. That night Hezbollah's fighters deployed from southern Beirut to the Qmatiyeh area tried to attack the hills near Aley but they were beaten back. After that Hezbollah tried to go on the offensive again and attacked their rival's positions. The Druze Militia had fought the Hezbollah militants from dug-in positions left over from the 1975-90 civil war. The Druze used hunting guns, AK 47 and other machine guns and RPGs to blast at the advancing Hezbollah. The offensive was backed up by Katyusha rockets fired from southern Beirut. Opposition forces bombarded the pro-government Druze area with artillery while ground forces attacked Druze positions using rockets and machine guns. By morning the pro-government Druze fighters agreed to stop the battle and several villages loyal to Lebanon's pro-government Druze leader Walid Jumblatt had been handed to the army. PSP stayed in the region. The kidnapped municipality police members were released by Hezbollah on May 12 in exchange of at least 30 hezbollah members that were kidnapped by PSP in Barouk mountain. After a day of relative quiet in Beirut renewed gunfire was heard in the commercial area of Hamra in the western part of the city shortly after midnight on May 12. The fighting occurred near the home of Future Movement leader Saad al-Hariri. A two-man Al Jazeera camera crew suffered injuries while trying to film the fighting and were evacuated by the Lebanese army. Meanwhile, in Tripoli clashes left one person dead and at least six others wounded. The Army stated that if the clashes did not end by morning of the next day they will intervene and use force if necessary to end the fighting. Starting at 06:00 a.m. May 13, local time, the Lebanese Army started to deploy to prevent any further fighting. After moving its headquarters, Future TV was back on the air by 4:30 p.m.
Lebanese Tourism Minister Joe Sarkis announced that the port of the bay of Jounieh will start accommodating ships and ferries for Lebanese arriving from and leaving to Cyprus. There was less fighting then during the previous days and the rival militias took the chance to bury their dead. On May 14, Lebanon's pro-government and opposition factions, had reached a deal to revoke the two decisions that sparked the fighting. On the same day, the opposition ended its civil disobedience campaign. Also, this day was when the airport had opened for one day to allow a plane to arrive for a meeting and then departure again. The Doha Agreement, made on 21 May 2008, was considered a victory for the Lebanese opposition as they secured their demand for veto-wielding power in the new government and a new electoral law which could benefit the opposition in the 2009 parliamentary elections. The agreement was considered by various Middle East analysts of being another blow to the Bush administration's policies in Lebanon. On June 17, three people were killed in clashes between pro- and anti-government residents in two villages in the Bekaa Valley, in eastern Lebanon, according to a Lebanese military official. On June 22 and June 23, at least nine people, eight civilians and a policeman, were killed and 55 others were wounded in Tripoli, in clashes between pro-government Sunnis based in the Bab el-Tabaneh district and pro-Syrian Alawites from Jabal Mohsen. Machine guns and rocket-propelled grenades were used in the clashes, which started around four in the morning. Also on June 22, a senior officer of the Islamist group Jund al-Sham, Imad Yassin, was wounded by a bomb, along with another Islamist, in the Palestinian refugee camp Ain al-Hilweh. A pro-Syrian Druze politician of the Lebanese Democratic Party, Saleh Aridi, was killed in a car bomb on September 11, 2008. Between July 25 and September 29, 23 people were killed in clashes between Sunni and Alawite militants in Tripoli. On September 8, Alawite and Sunni leaders signed a reconciliation agreement, which ended the fighting and tension which has haunted Tripoli since the civil war. Sunni Future Movement leader Saad Hariri subsequently visited Tripoli stating "We are both Lebanese and we will not allow anyone to tamper with us. I will do everything I can in order not to let anyone damage the Alawites' security in Tripoli and to foil any external plot to tamper with the security of the Alawites or the security of Tripoli". On August 13 and September 29, car bombs targeting civilian busses in Tripoli killing five soldiers in the first incident, and 16 people including 7 soldiers, in the second. Iran's Foreign Ministry Spokesman Mohammad-Ali Hosseini has called on national unity among the Lebanese adding that the situation can be "managed through talks and consensus-building." Hosseini blamed the U.S. and Israel for the ongoing hostilities in Lebanon. Saudi Foreign Minister Prince Saud al-Faisal accused Iran of "backing what happened in Lebanon, a coup" and called for "all regional parties to respect the independence and sovereignty of Lebanon and to stop meddling in its affairs and inciting sectarian tensions". He had further accused Hezbollah of taking "violent, offensive measures, which aim at an annihilation of people." Prime Minister Fouad Siniora urged the Lebanese army to restore order, assuring that the country won't fall to Hezbollah after four days of clashes. On May 11 Arab foreign ministers meeting in Cairo have urged an immediate halt to the fighting in Lebanon and agreed to send a ministerial delegation to Beirut to try to mediate an end to the crisis. During the heavy battles in Beirut and east and north of the city 42 people were killed and 164 were wounded while one Hezbollah supporter was missing. Among the dead were confirmed to be 25 pro-government and 15 opposition fighters, two soldiers and 16 civilians, 15 Lebanese and one Australian. Another 12 people were killed in June, including one policeman. A further nine died in July, also including one policeman. ^ a b c "Death toll in Lebanon rises to 18 as clashes intensify across country". Daily Star (Lebanon). Retrieved 2008-05-11. ^ a b c "Lebanon army gives gunmen deadline to disarm". Al Arabiya. Archived from the original on 2008-05-17. Retrieved 2008-05-13. ^ a b "Australian killed in Lebanon: DFAT". The Hawkesbury Gazette. Archived from the original on 2008-08-02. Retrieved 2008-05-12. ^ a b "Hezbollah withdrawing gunmen from Beirut". Al Arabiya. Archived from the original on 2008-05-11. Retrieved 2008-05-12. ^ "The psychological fallout of Lebanon's 'mini civil war'". Reuters. Retrieved 2008-06-22. ^ "Hezbollah takes over west Beirut". BBC news. 2008-05-09. Archived from the original on 11 May 2008. Retrieved 2008-05-10. ^ "Lebanon tensions rise in clash with Hezbollah". Haaretz. Archived from the original on 12 May 2008. Retrieved 2008-05-10. ^ "Lebanese army moves into W. Beirut after Hezbollah takeover". Haaretz. Archived from the original on 9 May 2008. Retrieved 2008-05-10. ^ "Hezbollah Pledges Pullout From Beirut as Army Makes Concession". Bloomberg L.P. 2008-05-10. Retrieved 2008-10-05. ^ Worth, Robert F.; Bakri, Nada (2008-05-11). "Hezbollah to Withdraw Gunmen in Lebanon". New York Times. Retrieved 2008-10-05. ^ "Lebanese leaders 'expect to elect a president' in 24 hours". France 24. Archived from the original on 2011-05-20. Retrieved 2008-05-31. ^ Cecil, Bill. "Half of Lebanon rallies to demand sweeping changes". workers.org. Archived from the original on 17 May 2008. Retrieved 2008-05-09. ^ "Hezbollah in control of west Beirut". Al Jazeera. Archived from the original on 11 May 2008. Retrieved 2008-05-09. ^ Chassay, Clancy (2006-12-13). "Christian leader says Lebanese opposition ready for power". London: The Guardian. Archived from the original on 11 April 2008. Retrieved 2008-05-13. ^ Patience, Martin (2007-01-26). "Lebanese Christians split over protests". BBC. Retrieved 2008-05-10. ^ Ladki, Nadim (2007-08-06). "Lebanon by-election highlights Christian disunity". Reuters. Archived from the original on 14 May 2008. Retrieved 2008-05-10. ^ "Aoun's hour". Al Ahram. Archived from the original on 2008-05-14. Retrieved 2008-05-13. ^ "Hersh: Bush administration arranged support for militants attacking Lebanon". The Raw Story. Archived from the original on 2008-04-27. Retrieved 2008-05-12. ^ Seymour M. Hersh. "The Redirection". The New Yorker. Archived from the original on 12 May 2008. Retrieved 2008-05-14. ^ "LEBANON: Saudis disown Sunni militia". Los Angeles Times. 2008-05-19. Archived from the original on 7 July 2008. Retrieved 2008-07-15. ^ "81 Dead in Lebanon as Hezbollah Clashes with US-Backed Pro-Government Forces". Democracy Now!. Archived from the original on 9 July 2008. Retrieved 2008-07-15. ^ "Hezbollah's big challenge". Asia Times. Archived from the original on October 7, 2009. Retrieved 2008-05-14. ^ a b "Beirut to axe Hezbollah telecoms". BBC news. 2008-05-06. Archived from the original on 10 May 2008. Retrieved 2008-05-10. ^ a b Jim Muir (2008-05-03). "Hezbollah in airport spying row". BBC news. Archived from the original on 6 May 2008. Retrieved 2008-05-10. ^ Nada Bakri (2008-05-09). "Shiite-Sunni Clashes Intensify in Beirut". The New York Times. Retrieved 2008-05-09. ^ "LEBANON: High prices, low wages feed violent political stand-off". IRIN. Archived from the original on 5 June 2008. Retrieved 2008-05-17. ^ a b "Gunbattles break out in Beirut". CNN. 2008-05-09. Archived from the original on 9 May 2008. Retrieved 2008-05-08. ^ "Hezbollah militants take over West Beirut". CNN. Archived from the original on 2008-05-10. Retrieved 2008-05-09. ^ "Beirut streets 'calm' after clashes". Al Jazeera. Archived from the original on 10 May 2008. Retrieved 2008-05-10. ^ "Lebanon death toll up following northern clash". Ynet. Archived from the original on 15 May 2008. Retrieved 2008-05-16. ^ "Six killed during Beirut funeral: medics". France 24. Archived from the original on May 10, 2008. Retrieved 2008-05-10. ^ "Aussie's death sparks Lebanon alert". The Sydney Morning Herald. 2008-05-12. Retrieved 30 July 2011. ^ Jackson, Andra (2008-05-12). "Melbourne man killed in Lebanon 'was on holiday'". The Age. Melbourne. Retrieved 30 July 2011. ^ "Day 5: Lebanese dare to hope worst is over". Daily Star (Lebanon). Archived from the original on 17 May 2008. Retrieved 2008-05-16. ^ "12 killed in pro and anti-government gun battle in northern Lebanon". Ynet. Retrieved 2008-05-16. ^ Robert F. Worth (2008-05-11). "Hezbollah to Withdraw Gunmen in Lebanon". The New York Times. Archived from the original on October 26, 2010. Retrieved 2008-05-11. ^ a b Yoav Stern. "Hezbollah fighters retreat from Beirut after 37 die in clashes". Haaretz. Archived from the original on 12 May 2008. Retrieved 11 May 2008. ^ "Lebanese army revokes government decisions against Hezbollah". France 24. Archived from the original on 2008-05-14. Retrieved 2008-05-11. ^ "Lebanese army sends troops north". BBC. 2008-05-11. Archived from the original on 14 May 2008. Retrieved 2008-05-16. ^ a b c "Day 5: Lebanese dare to hope worst is over". The Daily Star (Lebanon). Retrieved 2008-05-12. ^ Kandy Ringer. "Lebanon's Fighting Spreads to Druze Heartland". BBC News. Archived from the original on May 14, 2008. Retrieved 2008-12-24. ^ "Saturday's live coverage of the war in Lebanon". Ya Libnan. Archived from the original on 2008-06-12. Retrieved 2008-12-24. ^ "Fighting spreads in Lebanon". Al Jazeera. Archived from the original on 14 May 2008. Retrieved 2008-05-16. ^ Nicholas Blanford/Qmatiyeh (2008-05-13). "Hizballah's Toughest Foe in Lebanon". Time (magazine). Retrieved 2008-12-24. ^ "Hezbollah-led forces take revolt to mountains above Beirut". CNN. Archived from the original on 2008-05-14. Retrieved 2008-05-15. ^ "Hizballah's Toughest Foe in Lebanon". Time (magazine). Archived from the original on May 31, 2008. Retrieved 2008-05-14. ^ "Monday's live coverage of the war in Lebanon". Ya Libnan. Archived from the original on 2008-06-16. Retrieved 2008-12-24. ^ a b "Fresh clashes in north Lebanon". Al Jazeera. Archived from the original on 12 May 2008. Retrieved 2008-05-12. ^ "Tuesday's live coverage of the war in Lebanon". Ya Libnan. Archived from the original on 2008-05-17. Retrieved 2008-05-19. ^ "'Deal reached' on Lebanon impasse". Al Jazeera. Archived from the original on 16 May 2008. Retrieved 2008-05-15. ^ "Breaking News: Live coverage of the war in Lebanon". Ya Libnan. Archived from the original on 2008-05-15. Retrieved 2008-05-15. ^ "Several injured in northern Lebanon clashes". France 24. Archived from the original on 2011-05-20. Retrieved 2008-06-22. ^ "Three dead, 30 wounded in north Lebanon clashes". Reuters. 2008-06-22. Retrieved 2008-09-10. ^ "Heavy fighting rocks north Lebanon". Al Jazeera. Archived from the original on 9 September 2008. Retrieved 2008-09-10. ^ "Lebanon opposition member Saleh Aridi killed in car bomb blast". The Australian. 2008-09-11. Archived from the original on 2008-09-12. Retrieved 2008-09-30. ^ Chulov, Martin (2008-09-12). "Violence returns to Beirut as car bomb kills sheik". The Australian. Archived from the original on 2008-09-16. Retrieved 2008-09-30. ^ Suzan Haidamous. "North Lebanon reconciliation struck through joint efforts". Xinhua News Agency. Retrieved 2008-12-24. ^ "Hariri tells Alawites in north Lebanon: We are all Lebanese". Ya Libnan. Archived from the original on 2008-09-12. Retrieved 2008-12-24. ^ "Lebanon bomb hits bus carrying soldiers". London: Reuters. 2008-09-29. Archived from the original on 5 December 2008. Retrieved 2008-12-24. ^ Andrew Wander (2008-09-29). "Lebanon: Bus bomb kills soldiers in Tripoli". London: The Daily Telegraph. Retrieved 2008-12-24. ^ "Iran highlights need for Lebanese unity". Press TV. Archived from the original on 2011-07-25. Retrieved 2008-05-12. ^ "Lebanon army moves to end crisis". BBC News. 2008-05-10. Archived from the original on 11 May 2008. Retrieved 2008-05-10. ^ Karam, Zeina (2008-05-10). "Hezbollah fighters in Beirut melt away". Boston Globe. Archived from the original on June 13, 2008. Retrieved 2008-05-11. ^ "At least two dead in shooting at funeral in Lebanon". Reuters. 2008-05-10. Retrieved 2008-05-14. ^ "Hezbollah to withdraw gunmen in Lebanon". International Herald Tribune. Retrieved 2008-05-15. Martínez, Beatriz; Francesco Volpicella (September 2008). "Walking the tight wire - Conversations on the May 2008 Lebanese crisis". Transnational Institute. Retrieved 2009-01-19.